Looking for private in-home or in-studio Trombone lessons? Our Leonard teachers are ready to get you started. Find your teacher today! Learn from a pro in a friendly, focused environment. Jazz, classical, blues, latin, salsa, funk or get ready for band and auditions. All great musicians have great ears and great time feel (groove). That along with a study of the fundamentals of trombone technique will get us started. Then we'll add the kind of songs that you like to play, and other great trombone literature. My name is Ethan Warden. I'm a graduate of the University of Wisconsin - Madison where I received my Masters of Music Performance degree. Prier my adventure here at UW - Madison, I received my Batchlers of Music education - Instrumental from Missouri State University. 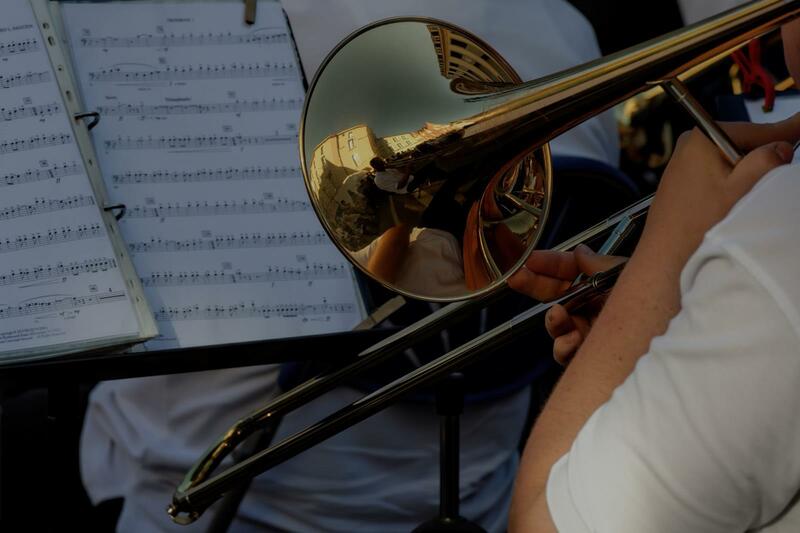 Students can expect an in-depth knowledge base of the trombone, including repertoire, fundamentals, and techniques, guiding them through a fun, relaxed lesson. I can get you proficient on the trombone to where you will understand breathing technique, slide position and tone production. We will also focus on reading and understanding music. I am a current band director focused on your student's success and mastery on the trombone. We will work on tone, range, and develop technique through a tailored lesson that will fit you or your student. I am also happy to supplement your child's band instruction and work on area/region honor band auditions with your child. Hi! I have a Bachelors in Music Education and have experience teaching many beginning students! I have 3 children and decided to give up regular teaching to be with them. I marched Drum and Bugle Corp and was taught a lot about Brass instruments during that time. I played a straight Baritone and Mellophone in different years. I believe that tone production is the most important area of study. It doesn’t matter what you can play if it doesn’t sound good. I can’t wait to help more students love to “play” on their instruments! I have been playing Brass instruments, specializing in Trombone, since 2004. I love teaching music, and welcome all ages to come out and try and toot their horn. I'll build a personalized lesson plan based on the students wants, and needs, and I'll do my absolute best to get you where ever you want to go musically. I have been playing the piano and the trombone since childhood. Growing up in a musical family, music has always played a big part in my life. I was active in school bands in addition to taking private lessons throughout grade school. In high school I was a member of Tri-M (a musical honor society), qualified for district band through audition, and was ranked in the top 10% of trombone players in the state of Virginia. Throughout my education I developed a working knowledge of brass instruments, music theory, a variety of playing styles, and much more. , The Sauerkrauts, 100% of whose proceeds go to benefit children in Shriner-owned hospitals. I have been giving private lessons since 2006, and have a deep passion for musical education. I feel learning to play an instrument enriches life in a way few other things can. Rachel was patient and had a great sense of humor! It immediately put me at ease. Would definitely recommend! Rachel was very kind and helpful. I just started learning, and she was patient with me despite this. Would highly recommend for a beginner. beginner to advanced gain a greater understanding of their instruments along with the fundamentals and technique to improve both technically and musically. My goal is to help you improve as a brass player and as an overall musician. I have extensive training in music theory and history to help foster a greater understanding and appreciation of music. I can help players from beginner to advanced gain a greater understanding of their instruments along with the fundamentals and technique to improve both technically and musically. Jeremy began playing at the age of six. Over the years, he developed his skills further by practicing and private lessons. He gained performance experience in the band and orchestral area by playing at such venues as Carnegie Hall and Lincoln Center. Though Jeremy can teach many genres of music, his musical personal favorites are orchestra and band which had great influence on his style of playing. ork in groups. He loves teaching music because its ability to shape lives and expose those to such a wonderful art form. Jeremy can teach trombone, bass trombone, tuba, euphonium, baritone and trumpet. Whether you are a beginner or a seasoned professional, Jeremy can help you expand and enhance your playing. Jeremy is excited to learn how he can help you reach your musical goals. Sign up now to schedule a meeting! "Great experience. Looking forward to the next lesson." "Carl is amazing! Learned so much!" "Carl is really knowledgeable about all aspects of music! I highly recommend him as a teacher!" "really nice to talk to."